As one of the top suppliers of bamboo and eucalyptus flooring in the US, people often contact us with questions about our products. Whether you want a floor that looks brilliant and is built to last or would like to help save the planet by choosing a sustainable material, eucalyptus is certainly one option to consider. It looks great in almost any room, adding class and style to a wide range of properties from residential and municipal buildings to commercial office blocks. It brings finesse to any modern dwelling and complements the timelessness of older homes. and is ideal for homes, and even commercial installations such as chic reception areas. Like bamboo, it’s hardness makes it suitable for busy environments such as restaurants or bars. Throw in the low cost and ease of installation and you won’t find any other type of flooring that covers all the bases. Eucalyptus trees are generally associated with Australia but there are actually over 700 different species found all over the world including the USA. Eucalyptus has become a great source of wood for flooring because of its ability to grow quickly compared to other trees. It is more comparable in this sense with bamboo, which is also used in flooring. It can be used as a hardwood covering or in strand woven form and is available in some beautiful grains and colors with varying shades. What are the Benefits of Eucalyptus Flooring? There are plenty of benefits for this type of flooring, not least how attractive it looks and how easy it is to maintain. 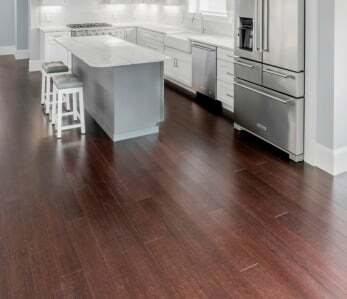 Eucalyptus flooring has become an increasingly popular choice for Americans in recent years, especially those looking for a durable but sustainable option. Renewable: The problem with many hardwood products is the time it takes to replace trees that have been cut down. As we know, when demand outpaces supply, we end up with a situation where trees are removed but not replaced, causing damage to the environment. Eucalyptus is one of the fastest growing species of tree and can reach a height of 120 feet in as little as 3-4 years. That means areas can be farmed regularly, producing a building material that is easily replaced. Durable: Strand woven eucalyptus is one of the densest and most durable floors out there and is much better than choices such as oak. All wood floorings will degrade over time but eucalyptus is more durable than many others which makes it a great choice for busy households. Affordable: Traditional wood flooring can be expensive. Eucalyptus flooring looks just as great and comes in at a significantly lower price. What Types of Eucalyptus Flooring Are There? There are two different types of eucalyptus flooring – traditional and strand woven. 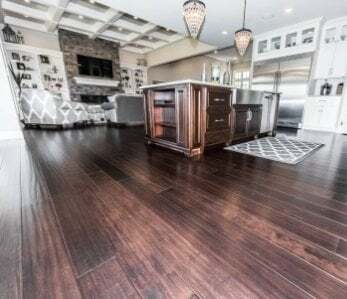 Traditional is made up of planks like traditional flooring and usually come in a tongue and grove construction that is fairly easy to install. is slightly different in that it is comprised of strips of eucalyptus that are pressed together under a high heat and pressure to produce high density planks. This makes a material that looks the same but is in fact a lot hardier. They can come in click and lock or tongue and grove and are suitable for high traffic areas and commercial locations. Is Eucalyptus Flooring Available in Different Colors? 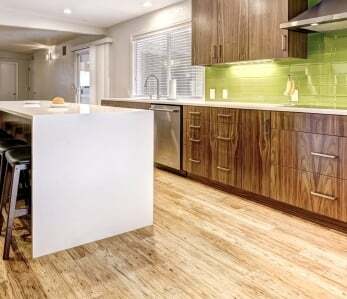 There are a variety of patterns and marbling that comes with strand woven eucalyptus flooring. Each one is different and you can be sure that what you have is unique to your home. Colors vary from colors that provide a great look for any property new or old. 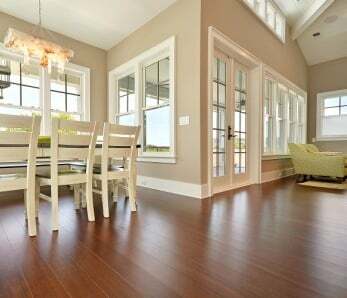 What’s the Difference Between Hardwood, Bamboo and Eucalyptus Flooring? All three provide a great, stylish flooring for any home but there are some important differences. Real hardwood flooring like oak is more expensive, less durable and less sustainable. Because of their speed of growth both bamboo and eucalyptus are considered the greener options. 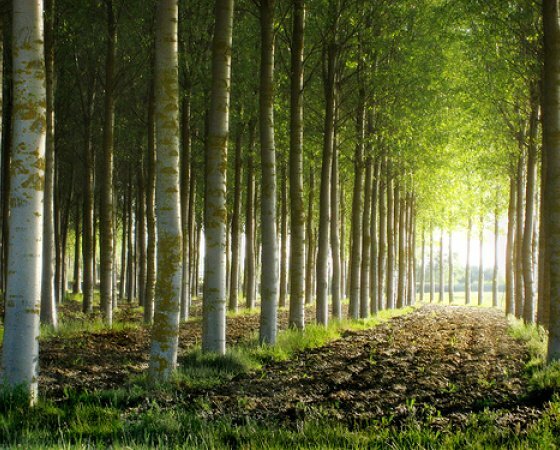 Strand woven eucalyptus is highly durable and comes at a much lower cost than hardwood, but slightly higher than bamboo; apart from that the difference between eucalyptus and bamboo is largely aesthetic. They both are installed and maintained much like traditional hardwood flooring. How Much Does Eucalyptus Flooring Cost? Eucalyptus flooring is one of the cheapest options if you want a sustainable and great looking product that lasts for a long time. Prices vary in the $3-$5 per square foot range. This compares favorably with the bamboo flooring which we also supply at Ambient. Is Eucalyptus Flooring Easy to Install? 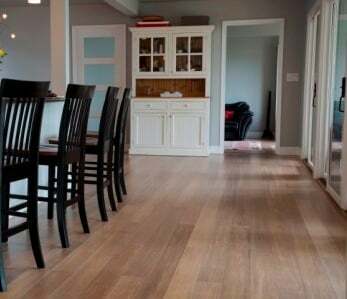 Eucalyptus flooring is just as easy to install as any other form of hardwood and comes in both click and lock and tongue and groove. Much depends on the level of the job you need undertaking and, even if you have some decent DIY skill, you may want to get a professional in to perform the installation for you. There are three different methods for installation: glue down, nail down and floating tongue and grove. A lot also depends on the surface that is being prepared for laying. Is Eucalyptus Flooring Right for my Home? Because it is incredibly hard, eucalyptus flooring is ideal for a variety of households. It can easily cope with busy homes with children and pets and with its great scratch resistance is also ideal for offices, salons and studios. Because it doesn’t expand due to moisture as much as other hardwoods, eucalyptus can also be installed in basements as long as the installation instructions are followed correctly. How Do I Care for My Eucalyptus Floor? Maintaining your eucalyptus floor is pretty simple and a little care and attention will ensure that it lasts for a long time and keeps its sheen. You won’t need to use harsh cleaners on it and generally a weekly once over with a vacuum or brush should do the job. For deeper cleans you can use a suitable hardwood cleaner. If you do spill liquid onto the surface, then wipe it up immediately with a dry cloth. Finally, it’s always a good idea to have welcome mats by outside doors so people can wipe their feet.